The personal and social lives of a group of friends are on display in this modern novel of manners. 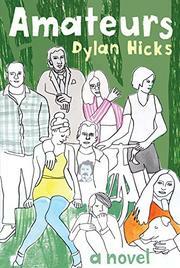 Hicks’ second novel, after Boarded Windows (2012), is smart, witty, and endearing. In a brief prologue, dated April 1972, we meet the Crennel family. Marion, a daughter, has written an unfinished novel that was “meant to be a parody and refraction of the kind of nuptial denouement one finds in Shakespeare or Austen.” (Sounds a lot like Hicks’ own novel.) She hides it in the attic. Then Part 1, titled "Prenuptial," begins in May 2011. The novel is divided into months over 11 years. Episodes go back and forth in time. We meet characters in one episode and then jump a few years ahead in the next episode to see them now older, maybe wiser. New characters, mostly minor, pop up along the way, and gradually, all the characters are jumping back and forth in time, slowly moving toward Part 2, "Postnuptial," with the last episode set in September 2011. It’s very much a modern Austen-esque novel of manners. Carefully plotted, it’s jumpy at first, but once settled in, the story takes off, providing a clever, jaunty ride. In May 2011, we first meet Karyn and her young son, Maxwell. She’s been invited to her cousin Archer Bondarenko’s wedding to Gemma in June. His family makes dildos, and they’re plenty rich. He’s published a successful novel which he may or may not have written. In August 2004, we meet Sara Crennel, a burgeoning writer; she’s with Lucas Pope, who was previously with Gemma. Sara may or may not have written Archer’s novel. Scandal ensues. A handy score card of who what when helps keep track of everyone in this sprightly tale about friendship and courtship, money, love, assorted complications—and writers. Felicitous characters and a scrumptious plot make Hicks’ second novel refreshing and fun.